Serve in bread or on a bed of lettuce. You could make french fries, homemade potato chips or we usually have kettle baked salt and vinegar potato chips. I added about 1 tsp. of fresh mint minced. 4 rounds of flat bread or pita. Still looking for the best flat or peta bread to use any suggestions. It has to be soft and pliable. I usually heat mine in low oven or toaster oven. Microwave can make rubbery. Have also added crumbled feta cheese. 2. I roll out on parchment paper until very thin into oblong patty, 1/4″ or thinner. Refrigerate for an hour. Then divide into 4 parts. 3. I tried on broiler but could not get the crispness I was looking for at least with my broiler. I have been grilling it for about 3 minutes per side it got crisper. I might try the new 360 cookware pan Lyn ( my wife) got us to see how that crisps up. You can see i am still looking for that crispness the open flame spit cooking method gets. 3. Grill patties over a hot fire for 2 – 4 minutes per side. 4. 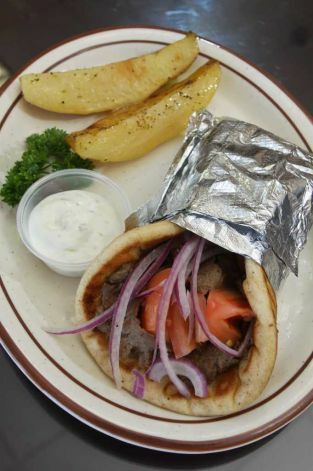 Spread tzatziki sauce down the center of a flat bread round, add a lettuce , add some sliced or diced tomato, some very thinly sliced onion (optional) and some crumbled feta cheese (optional), fold the bread over the lamb wrap with tin foil, and enjoy. Note: wrapping in foil helps hold things together while you eat it. Tzatziki” is the Greek name for this yogurt-based sauce recipe. 1/2 lemon juiced about 2-3 tbsp. A pinch or two of cumin to this. I also have added Dill to mine. 1. Place whole, un-peeled garlic gloves in a small, un-oiled skillet over medium low heat and cook for about two minutes per side – until lightly browned. Peel and chop finely. Note: The sauce is better if you allow it to sit in the refrigerator for a couple of hours before using. This entry was posted in Lamb, Meat, Sandwiches and tagged cummin, feta, Greek, Gyros, lamb, peta, tomato, Tzatziki, yogart. Bookmark the permalink. Glad you enjoyed it. We love lamb.